Find the brands you love at prices that work for you with a TJX gift card! Our buyers negotiate amazing deals with top designers and pass the savings to you. Departments include apparel, shoes, home, beauty, and accessories. 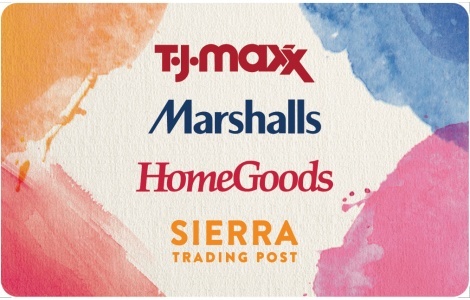 The TJX gift card is redeemable at over 2800 T.J.Maxx, Marshalls, HomeGoods, and Sierra stores (in the U.S. and Puerto Rico) and online at tjmaxx.com and sierra.com. National Gift Card is the best place for you to order gift cards in bulk. We are the experts in all things gift cards and can set up your gift card solutions program for you today. Please contact us for more information on T.J. Maxx bulk, direct-to-recipient, or individual gift card fulfillment for your gift card program. Contact us online or call us at 888-472-8747 today.